Students in Anne Somers' honors biology class plant nectar plants in a no-mow zone on campus. 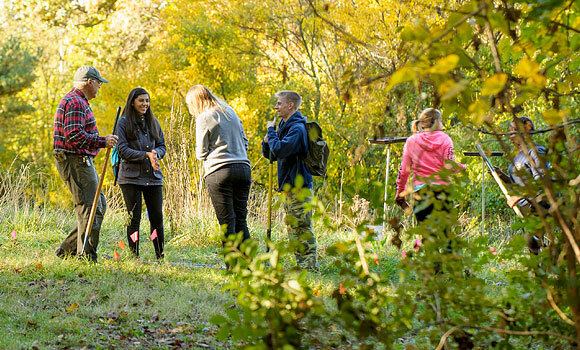 From planting seeds to handling snakes, the 17 students in Anne Somers’ honors biology class spent the fall semester experiencing the great outdoors. “This is an experiential and service learning class,” Somers said. In addition to traditional classroom work, students were required to complete 20 hours of environmental service and spend at least 25 hours outdoors. “Their lives are missing opportunities to connect with and learn from the natural world,” Somers said. James Bredom, a sophomore majoring in political science and Russian, said the class taught him the impact of humanity on the environment. Even though the biology class didn’t directly pertain to his majors, it was an opportunity to delve into some of his personal interests. Over the course of the semester, students climbed trees, set turtle traps, watched black bear foraging, safely handled wild snakes and slept under the stars. Many of the students saw the Milky Way for the first time. One environmental service project in particular, however, forced the students to get their hands dirty. The class planted nectar plants, like milkweed, provided by the North Carolina Wildlife Federation, in two no-mow zones on UNCG’s campus. They were aided by Peter Ashe, grounds worker and athletic fields manager. As pollinators, monarch butterflies are “sentinels for environmental quality, but monarch populations are crashing,” Somers said. “We developed no mow zones to cut down on our labor and to help pollinators,” Ashe explained. Each year, monarch butterflies migrate north and south in the spring and fall, respectively. Without the right plants along the way for the butterflies to feed on, there is little hope of survival for these vital pollinators. Somers and her students hope the pollinator gardens, along with others across the state called the Butterfly Highway, will make a lasting impact on the butterfly and pollinator populations, and, consequently, environmental quality and beauty.